Here is a fun recycled project that is quick and easy. It is guaranteed to make people smile when they realize the coasters are constructed from soda can metal. What is your favorite flavor of soda? Project designed by Lorine Mason. 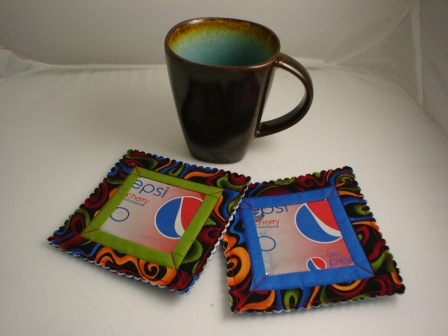 Hear Lorine talk about these Soda Can Coasters on FaveCrafts Radio. Read our blog post to learn more about the March 2, 2011 FaveCrafts Radio show. Wash out the soda can, turn it over onto a dry cloth and let it drip dry. Cut the can apart using craft scissors (no, not your sewing scissors) along the top and bottom edge of the can. Be careful not to cut your fingers as the edges can be quite sharp. Press fusible web to the back of the metal. Using a rotary cutter, mat and ruler, cut 3-inch squares. Remove the paper backing from the metal square and press it to the center of a 5-inch square of scrap cotton fabric. Cut 1-inch wide strips from two complementary fabrics. With right sides together, stitch the solid color strips of fabric along both sides of the 3-inch square, stitching through the scrap fabric base. Trim the strips even with the top and bottom edges of the metal square. Press the fabric away from the metal center piece. Repeat, stitching additional strips to the top and bottom edges of the 3-inch square, trimming and pressing the strips away from the center. Repeat, stitching the second row of fabric strips to the outside edges of the first row of sewn strips. Trim and press the second row away from the metal center piece. You have created the top layer of the coaster. Layer the following together, right sides up. The top layer of the coaster is a 5-inch square of heavyweight craft double-sided fusible interfacing and a 5-inch square of felt. Press well. Sew through all layers of the coaster, stitching between the two rows of fabric strips and then again 1/4 inch in from the outside edge of the coaster fabric. Trim close to the outside stitching lines using pinking or scalloped scissors. I love this idea I have many friends who through away the soda cans I will try to make this for my grandson's graduation party. To surprise ever one I really love this site it is the best web site for me.